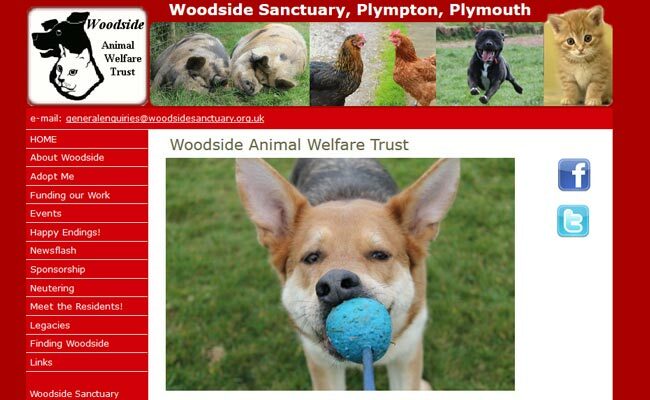 The Woodside Animal Welfare Trust in Plymouth, Devon, is an animal rehoming charity. The foundation of Woodside's broad field of work was begun in 1974 by Carole Bowles. In addition to pets which are suitable for adoption, the countryside sanctuary has a collection of resident pets that are unlikely to be adopted, such as the elderly and long-term sick. We’re aware that some organisations have rigid rules about not homing to elderly owners, or families with young children. We prefer to take each home on merit and place the needs of the pet first. Some dogs adore young children and enjoy their boisterous play, while other, often mature pets, look for a low exercise, quiet life with matching owners. The one thing we always insist on is that no breeding takes place. Young pets are always logged in for doctoring as soon as they are of suitable age. Pre-home checks are carried out before adoption can go ahead. This includes ensuring that the new family is appropriate for the animal requested and that the home provides a safe environment. E.g an escape proof garden for dogs. Post adoption checks are also mandatory, with a second if felt necessary.